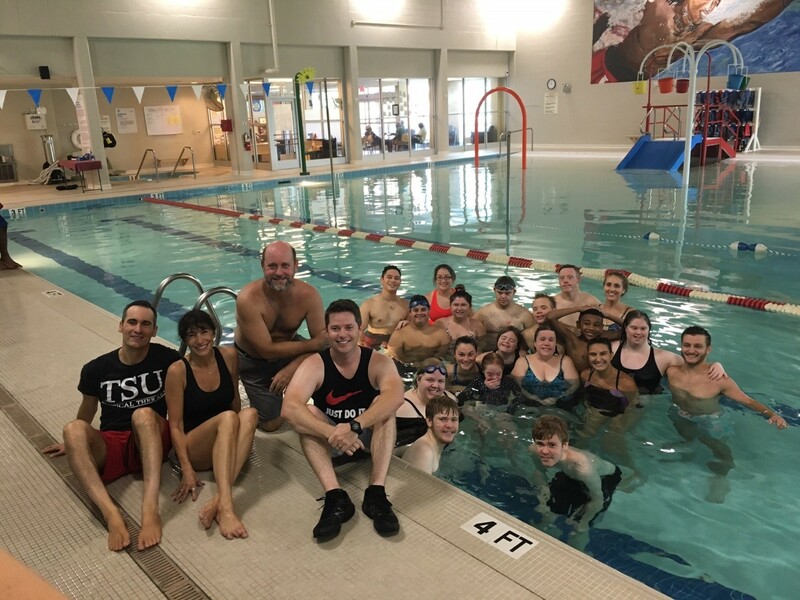 Eight years ago Dr. Natalie Michaels, associate professor of occupational therapy (OT), started the Aquifit program to provide aquatic exercises for wellness, socialization and enjoyment to members of the community. Originally designed to target older adults, Aquifit exercises are performed to music pool-side by physical therapists, occupational therapists, aquatic specialists, OT students and physical therapy (PT) students while community members exercise in the water. Michaels was joined by Dr. Timothy Jones (Tennessee State University), Dr. Derek Charles (also from TSU) and Dr Joshua Maloney (Amedisys Home Health). Belmont students who participated in the event included Autumn Powell, Haley Hingtgen and Rachel Morgan from the occupational therapy program as well as Jonathan Lee, Sarah Williams, Kandiss Anderson, Lacie Nugent and Beau Kovach from the physical therapy program. Approximately 15 members of the Dolphins participated. They reported that they had a “wonderful” and “fun” time, and they really seemed to enjoy their interactions with the Belmont students.